The ongoing expansion of the mataf (the circumambulation area around the Kaaba) will double the hourly capacity of the area from 48,000 pilgrims to 105,000 pilgrims after its completion in three years. The expansion project, ordered by Custodian of the Two Holy Mosques King Abdullah, is expected to be completed in October 2015. It will accommodate more worshippers when the capacity in the other parts of the Grand Mosque rises to 2.5 million people following the completion of the entire expansion project. The number of pillars in the Grand Mosque will be reduced by 44 percent when the project is completed, according to a documentary film on the expansion run by Saudi Channel 1 on Wednesday night. "The pillars on the ground floor and the basement will be reduced by 30 percent and by 75 percent on the first floor," the film showed. The width of the mataf's roof will increase from the present 20 meters to 50 meters, which will help reduce crowding during tawaf (circumambulation). Bridges connecting various levels on the first floor will be parallel to the levels on the present mataf. The ground floor will be linked directly with the basement and masaa (the running space between the hillocks of Al-Safa and Al-Marwa) in the second phase of the expansion. The new project will preserve the heritage and construction style of the Grand Mosque. The whole project will be completed in three stages over the next three years. 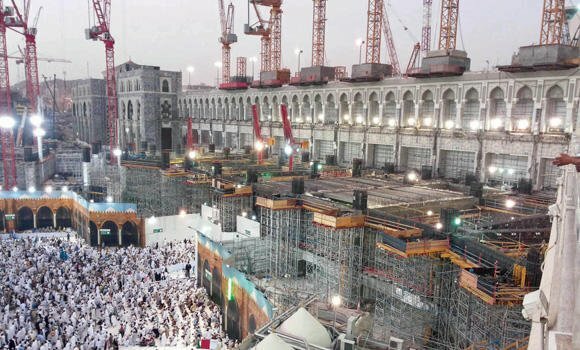 When the first phase of the project was launched in November 2012, construction around the mataf reduced the number of pilgrims performing tawaf to 22,000 pilgrims an hour. Temporary efforts are under way to increase the capacity from 22,000 to 35,000 pilgrims in view of the huge number of pilgrims and visitors expected to arrive for tawaf during Ramadan. Construction of temporary mataf floors of metal, connected to the mataf on the first floor, is under way currently. This is for people with special needs during Ramadan. The work will be suspended during Ramadan and resume immediately afterward. During the first phase, the temporary fences separating the work areas will be restructured and the first floor construction completed. The construction of a temporary basement floor for the mataf at 10 meters wide is also included in the first phase. The work will be suspended during Haj and resume afterward. Construction of the second phase will start with the removal of more structures that block the expansion work. During this stage, tawaf will be allowed only in the available space. After the Haj in 2013, the third phase will start and be completed toward the end of the year.